EIPA attendees at the Annual Meeting on November 10th were treated to readings and musings by South Carolina Author Roger Pinckney XI. Pinckney is a long-term resident of Daufuskie Island and has worked with locals to try to protect this special island south of Hilton Head. He knows most permanent residents of the island, speaks Gullah and has seen many development projects fail to the delight of those residents. Pinckney read an excerpt from Crying in the Wilderness which helped everyone understand the way of life on Daufuskie and the views of its residents. Author of books including Blue Roots, Reefer Moon, and The Mullet Manifesto, Pinckney held a book signing as many of the attendees talked with him about his conservation actions. 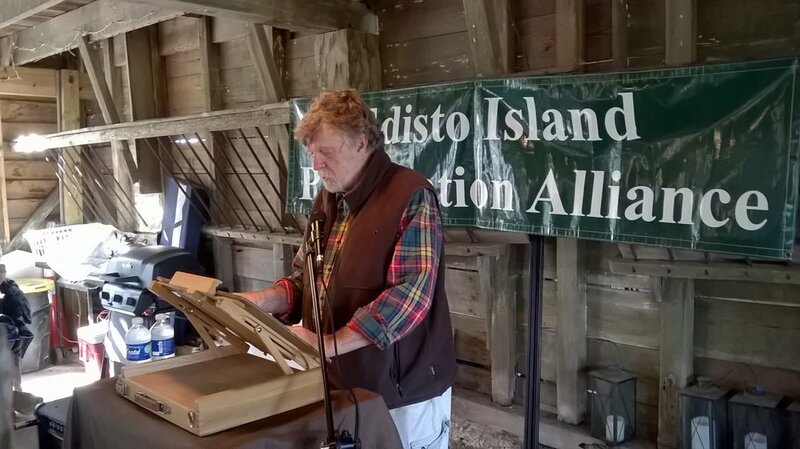 EIPA’s Annual Meeting was held on Saturday, November 10th, at the beautiful Sunnyside Plantation (thanks to Sid Gautheaux, Jr, PHD, and Carroll Belser). The wonderful fall day brought out 75 people to celebrate the work of EIPA throughout 2018. Our President, Barbara Gould, updated everyone on our efforts this year. We have worked to maintain the rural character of Edisto Island by monitoring zoning efforts and organizing groups to talk at County Council meetings on that and on the use of the 1/2 cent sales tax. We continue to support students attending Camp Green River through the Burly Lyons scholarship fund. EIPA was also able to replace the National Scenic Byway sign at the Washington Bridge that had been taken out in a car accident. Board member Bob Newton was instrumental in getting this beautiful sign created again.